I haven’t done one of these in a while! Right now I have a seriously broken camera so it’s all about the phone pictures this time around. Flowers from my dad. See I’m a little laid up at the moment. Last week was a symphony of pain down my right leg culminating in an early morning visit to the emergency room on Sunday. Sciatica was the initial diagnosis. My doctor found spasms all over my back and hips which are pressing on that horrible nerve. She’s an osteopath so some manipulation and some lovely drugs and I’m on the mend. Slowly. 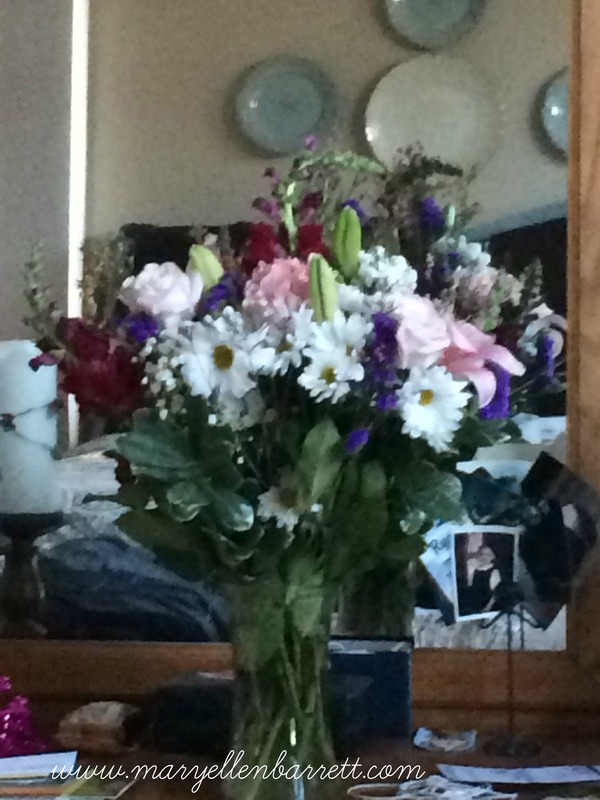 Right now I’m sitting in bed looking at my flowers and actually getting some writing done. The view is nice, thanks Dad. 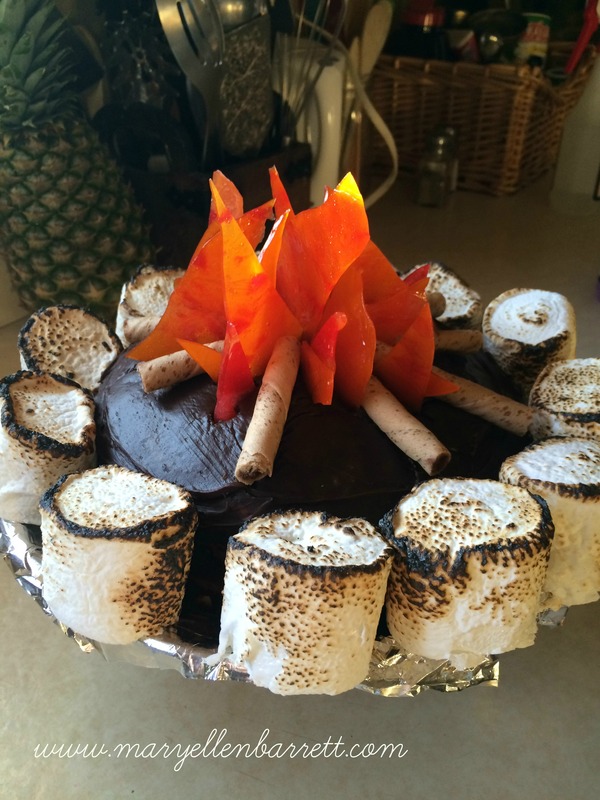 Last Friday was Kevin’s birthday and his campfire cake made him really happy. It made me happy to make it for him. I used to do elaborate cakes for the older ones and, well one thing led to another (more babies) and I stopped. Now that people are older I can manage it more easily. This cake was a straight up copy of Jessica’s cake from a few years ago. Her directions were great and it came together very easily. This is the newest member of the Barrett clan. His name is G.K. Chesteron Barrett. 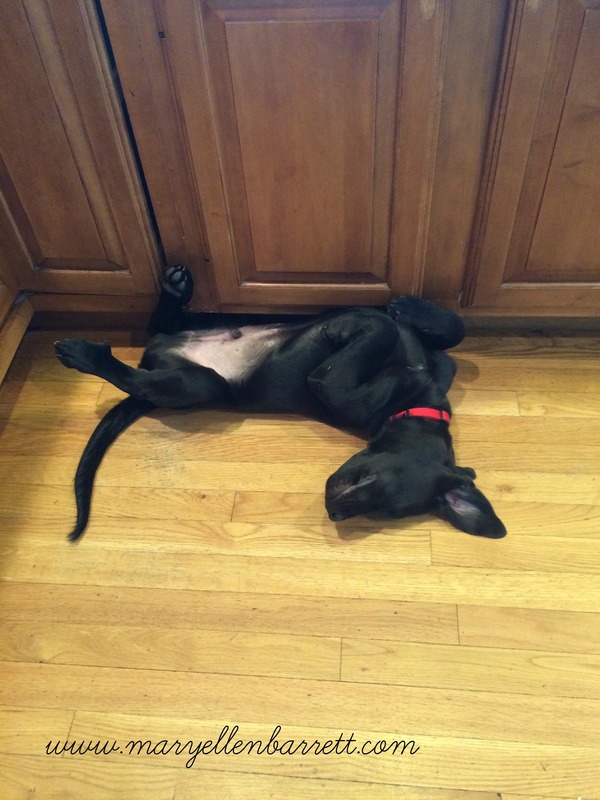 In the house he is known as Chester and this is his preferred sleeping position. This makes him funny even when he is sleeping.We’ve had him for almost three weeks now and he’s settled into the routine nicely. A little more housebreaking and he will be perfect. We got him from Miracoli Farm Puppies and they are amazing breeders. Chester came to us well socialized, disciplined and with a calm temperament (for a puppy). He is providing a lot of joy here. 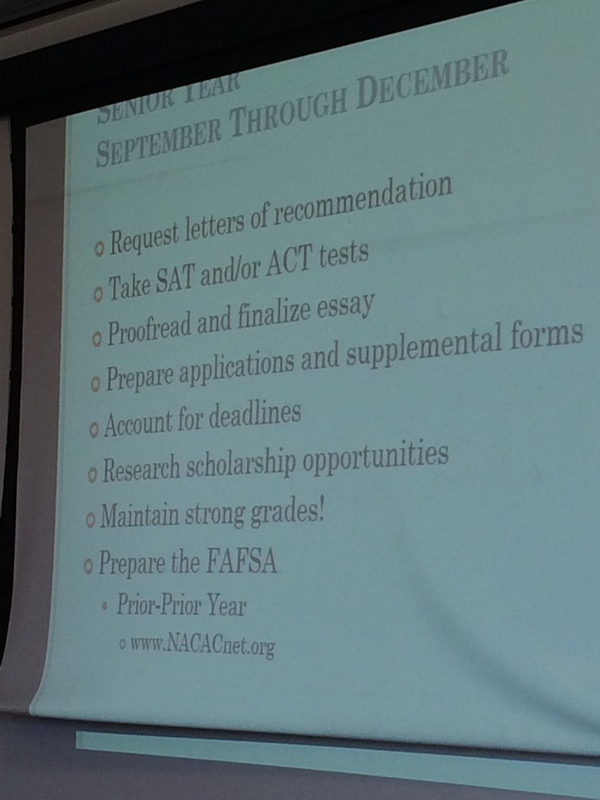 This is a shot of a screen from a presentation I attended at a local college last weekend. It was a combination of a mock audition for Erin, to prepare her for the (hopefully) many she will have next year and a how-to for parents of musicians to navigate the whole application/demo tape/audition process. It’s essentially the same nightmare college application process with a bunch of hair stuck on it. If you have any contentment to share do so over at Like Mother, Like Daughter blog. I’m sorry you’re going through all this pain! I have much empathy for you. Prayers for you to be walking around pain free very soon! That presentation looks very scary. I’m not looking forward to that stage! Thanks so much for joining! Love the cake!!! The cake turned out awesome!!! I’m so sorry you aren’t feeling well! I am currently suffering from a broken tailbone, so I can relate a bit. I’ll be praying for you!